Like her country, Karima--a widow with eight children--was caught between America and Saddam. It was March 2003 in proud but battered Baghdad. As night drew near, she took her son to board a rickety bus to join Hussein's army. "God protect you," she said, handing him something she could not afford to give--the thirty-cent fare. The Washington Post's Anthony Shadid also went to war in Iraq although he was neither embedded with soldiers nor briefed by politicians. Because he is fluent in Arabic, Shadid--an Arab American born and raised in Oklahoma--was able to disappear into the divided, dangerous worlds of Iraq. 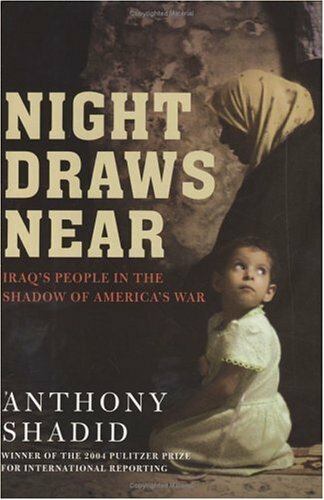 Day by day, as the American dream of freedom clashed with Arab notions of justice, he pieced together the human story of ordinary Iraqis weathering the terrible dislocations and tragedies of war. Through the lives of men and women, Sunnis and Shiites, American sympathizers and outraged young jihadists newly transformed into martyrs, Shadid shows us the journey of defiant, hopeful, resilient Iraq. Moving from battle scenes to subdued streets enlivened only by the call to prayer, Shadid uses the experiences of his characters to illustrate how Saddam's downfall paved the way not only for democracy but also for an Islamic reawakening and jihad. Night Draws Near--as compelling as it is human--is an illuminating and poignant account from a repoter whose coverage has drawn international attention and acclaim.